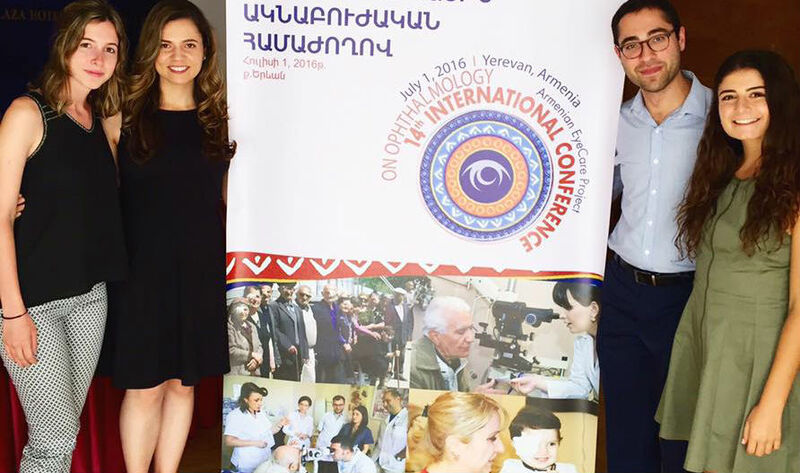 An undergraduate student at the University of California Santa Barbara (UCSB), Nairi Rostomian recounts her experience joining the Armenian EyeCare Project as a medical observer during our 52nd Medical Mission to Armenia this summer. Children are brought into this world frantically gasping for air and trying to make sense of the commotion and noise around them. They are given a blank slate in life and have the opportunity to paint it as they wish. Walking into the Malayan Ophthalmological Center (MOC) in Yerevan to embark on my first observership with the Armenian Eye Care Project (AECP) was the equivalent of a blank slate. As the youngest student observer, I did not know what to expect. Everyone around me was so educated, so acclimated, and so natural in the hospital environment, it was as if I was the child and they were the new world I ventured into. It took me only a few seconds to feel completely at home at this observership, mainly because from the moment I walked in, that ‘newborn’ commotion that I felt was exactly what I wanted from this experience. On every floor of the hospital there were physicians and nurses giving people the gift of sight. Clearly that is no easy task, there were people running around dilating pupils, checking visual acuity, measuring intraocular pressure and evaluating patients for their pre- and post- op care. This observership put me — someone who knew as much about eye care as a newborn — right at the heart of where all the magic happens. I feel as if this experience was especially unique to me considering I am still an undergraduate student who viewed medical school and becoming an ophthalmologist as this radical dream in the not-so-distant future. The exposure I got through the AECP solidified my decision to become a physician just like those whom I had the pleasure to see in action at the Malayan Ophthalmological Center and their newly opened ambulatory surgical center in Spitak Village, which was devastated by the 1988 earthquake. The patience and willingness of these physicians and nurses to teach me and my fellow observers was a true blessing. I could not have imagined seeing some of the rare Retinopathy of Prematurity (ROP) cases among premature babies; observing malignant eye lid tumor resections; and learning about the AECP’s Mobile Eye Hospital, a surgical suite on wheels where a talented ophthalmologist performs over 1,600 surgeries in different parts of Armenia to reach patients who have difficultly traveling to Yerevan for care. 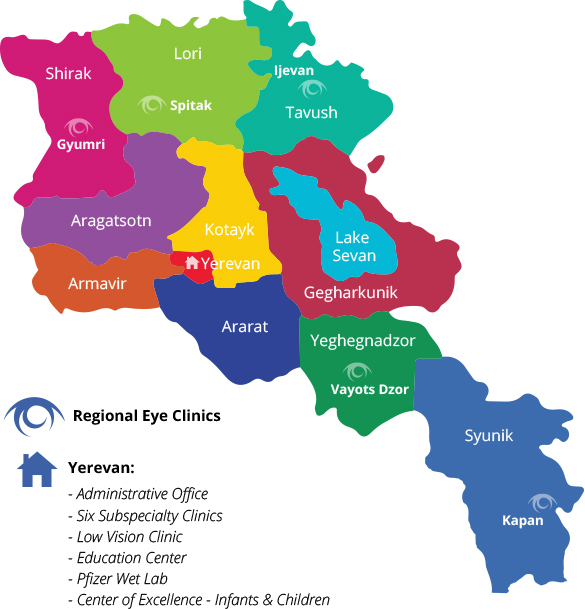 The AECP has also helped develop the Center of Excellence for the Prevention of Childhood Blindness in Yerevan — a cutting-edge medical facility aimed to prevent childhood blindness not only in Armenia, but in the entire Caucus region and is currently developing five Regional Eye Clinics across remote villages in Armenia. What really resonated with me during my observership were the Retinopathy of Prematurity (ROP) consultations with the Director of Children’s Hospital Los Angeles (CHLA) Eye Group, Dr. Thomas Lee. I saw children who have lost vision in either one or both eyes due to ROP. Dr. Lee took his time to do complete examinations, but also explained to the young parents about the long-term treatment plans and their prognosis. With the help of interpreters, he was able to make the healing connection with these worried parents regarding how to raise a child with significant visual disability. As I embark on my premedical academic career, I certainly have a lot to learn from “others” and I am so grateful that the AECP Medical Observership offered me the opportunity to reinforce my “solidarity” with my motherland and I am looking forward to many more trips to Armenia in the future. I am so thankful that the AECP gave me the eyes to not just look, but to really see. If you liked reading Nairi’s reflection of her Observership with the AECP, read another by fellow Medical Observer, Anna Ter-Zakarian.